Following these parking lot safety tips will create a safer environment for customers and employees. Parking lots can be dangerous places if the proper precautions aren’t implemented. Damage to vehicles and store property can occur, and pedestrians are also at risk for accidents and theft. Some commonsense investments can make a big difference. 1. Control the flow of traffic. Controlling traffic flow will prevent cars from driving in the wrong direction or through the parking lot, minimizing the risk of accidents. A few methods for controlling traffic flow include designating separate entrances and exits, installing speed bumps and making sure parking spaces have visible lines. 2. Make sure the parking lot is well lit. A well-lit parking lot helps prevent theft as well as vehicle accidents and pedestrian accidents, such as tripping or falling. 3. Install bollards to prevent vehicle damage to storefronts. Cars run into buildings more often than you think. The Commercial Real Estate Development Association estimates there are more than 50 accidents every day involving vehicles colliding with commercial buildings. Installing bollards around storefronts is an easy way to fix this problem. Learn more about why bollards are an effective solution. 4. Install cart corrals. Cart corrals invite customers to voluntarily return carts, preventing them from rolling through the parking lot and damaging cars, pedestrians and buildings. 5. Create pedestrian walkways. A well-designed pedestrian walkway placed in busy areas of the parking lot can serve two purposes. First, it will make drivers aware of pedestrian traffic so they will anticipate stopping. Second, it will (hopefully) discourage pedestrians from taking shortcuts and conflicting with vehicle traffic. 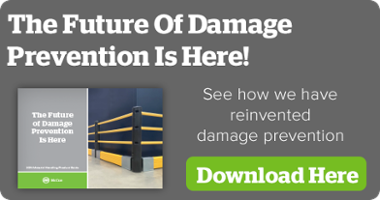 A part of ensuring parking lots are safe involves installing the best safety products. At McCue, we’re dedicated to providing our customers with the best, most innovative solutions on the market, including parking lot cart corrals, bollards, signs and more. Contact us to request more information.